Our school gardening club has been focusing on art projects in January and February while we wait for some warmer weather to begin our planting. Our gardening club mission, as well as growing all sorts of fruit and veg, is to make the space as eco friendly as possible and a feast for all the senses. 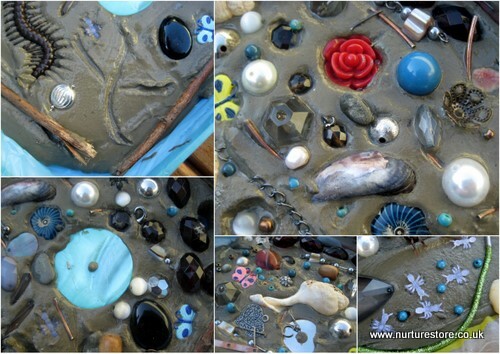 This garden tile project used lots of recycled and found materials and created art which is a treat for the eyes and also the hands. It introduced the children (and us) to a new technique and a new material, and created a permanent outside art gallery for us to enjoy all year round. Here’s how we made our garden tile art. 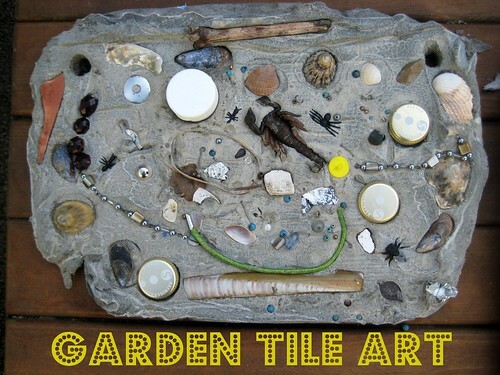 We knew we wanted to make some tiles that the children could press all sorts of art materials into to create an eco collage, and that we wanted the art to be displayed outside in the garden where it was made. We thought about using air drying clay or salt dough but knew they wouldn’t stand up to being outside in all weathers. We also considered clay we could fire but realised the materials the children were adding to their collages would get damaged in the process. 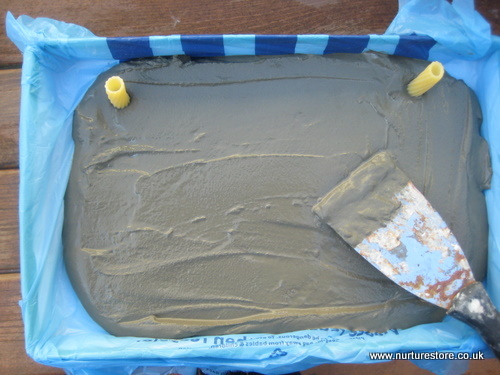 So we settled on cement, which was easy to mix, held all the materials perfectly and could stay outside come rain or shine. We showed the children some tile designs which I’d collated on my Kids Garden Pinterest board but then left it to them to free style and compose their own garden tile art. They really enjoyed the process of selecting their treasures and pressing the objects into the cement. They also used twigs to write words and make marks, creating patterns and animal tracks in the tiles. Once the designs were completed we left the tiles exactly where they were to dry out and set – best not to move them at all if you can avoid it, so the integrity of the cement isn’t affected. The tiles were beginning to set after a couple of hours, when we removed the pasta pieces, and we left the tiles in the shoe box lids for a couple of days until they were completely hard and dry. The tiles then popped out of the plastic bag linings very easily. We will add garden twine through the holes and hang the tiles in the garden to create a garden tile gallery. 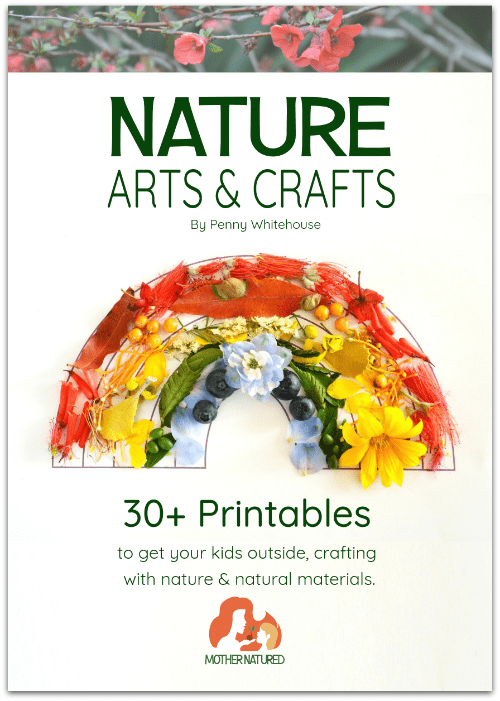 Previous article: Water bead scienceNext article: Kids Art Explorers : yarn! These are just wonderful! Love them! I love this idea – I’ve seen something similar done with Guneria leaves on pinterest and thinking of doing both ideas as stepping stone in the kids area of the garden. We will be pinning this idea for the spring. Thanks so much for the inspiration! Ooh what fun! Will you be displaying these in the garden? I bet they look fabulous. Gorgeous! So many design options. Pinned. These are classic and fabulous! (Except for the ones with scorpions, I have a phobia.) Love them, and such a great tutorial! Oh Michelle L, did you spot the maggots? I really wanted to throw them away before the kids even got to use them! Eew. Beautiful! I love concrete, and making collages like this is great! Oh, love this one! Thanks so much for sharing on craft Schooling Sunday! Fantastic! I definitely want to make some of these for our garden at home! What a lovely way to make your mark! I imagine they’d also be nice with leaves and feathers pressed into them and removed, to just leave an imprint. Thx so much for sharing at the Outdoor Play Party! Another corker, this will make the garden so much more child friendly and attractive for The Boy. I think we might do it for momentoes from special trips away too? I’m seeing a beach one, etc. 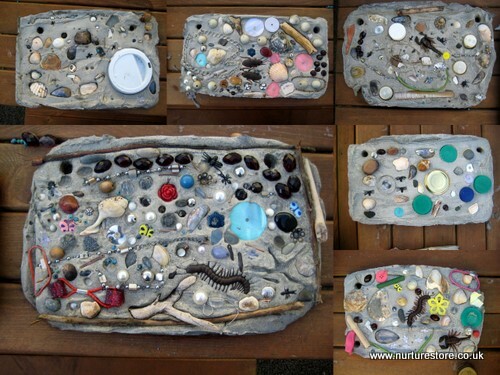 Yes TheBoyandMe, we are heading to the beach in the summer holiday and I’m planning on beachcombing for treasure we can use to make one of these. So pretty! We have a big bag of cement just using up space in our garage. Now, I know what we can use it for! Thanks for linking up at The Outdoor Play Party! This is great. Our church would love this project! The kids could make one to take home but then also make some to leave at our garden at church! 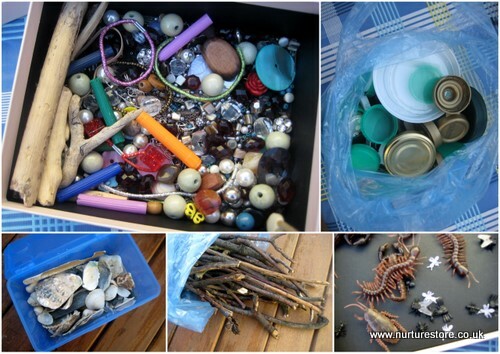 Thanks so much for sharing this on the outdoor play link up!